The Ginger Snap Girl: The Ginger Snap Girl Turns 1! About 2 months ago I realized that I was approaching the one year anniversary of The Ginger Snap Girl. Had that much time passed already? I remember last year when I accidentally stumbled into the food blogging world and thought I had struck the motherlode! How were there so many talented cooks and bakers out there sharing their stories, recipes and stunning photos and I never knew stuff like this existed? I felt a little like a kid in a candy store and couldn't wait to sit down in front of my laptop each evening to peruse the eye candy for the next cool sweet treat to try in my own kitchen. It was a bit obsessive really. My Hubby thought I had been abducted by aliens because my myriad of TV shows were piling up on the DVR, unwatched. Gossip Girl would have to wait. After about a week of engrossing myself in my new playground I started thinking about starting my own blog. Why not? To be honest I was actually scared and nervous. What would I make? What would I write? What if it required technical computer skills? Who would read it? What if no one reads it? That would be kind of sad. Then I thought, it really doesn't matter since I was pretty sure at least my Grandma Jane would read it. Ok, let's do it! Plus I was super excited to join an online baking group--Sweet Melissa Sundays which required having a blog. And so The Ginger Snap Girl was born (check out my first post). This past year has been quite a journey. Starting a blog. Finding out that Grandma Jane isn't the only one reading it. Building new cyber friendships. Learning soooo much. It feels like my skills have increased exponentially, but yet I still have so many more I want to tackle. The year was filled with lots of delicious desserts, such as this one, some not so delicious desserts, a few tears and a swear word or two. I have learned more than I would have ever imagined when I set out to start this blog. I have been humbled by it as well. Apparently the ability to bake a few kinds of cookies doesn't make one an experienced baker. I didn't even realize how many facets of baking and confections there were to accomplish until I started this adventure! This past year I also fought a personal battle that caused me to take a brief break from blogging. I was diagnosed with breast cancer at age 36. Thankfully it was a slow growing cancer, stage 1, and I was successfully treated with surgery and localized radiation. I feel incredibly lucky. No chemo was needed and I have been officially cancer free for 6 months. I haven't talked about that part of my life much in this forum, but will be planning to give it a little more air time in the coming year. Since my diagnosis last September, I know 2 other women who have been diagnosed during that time, both with far more aggressive cancers than I had. It's something that can touch all of us...whether it's you, your friend, sister or mother. I look forward to the opportunity to bring more awareness to this form of cancer that affects so many of us. 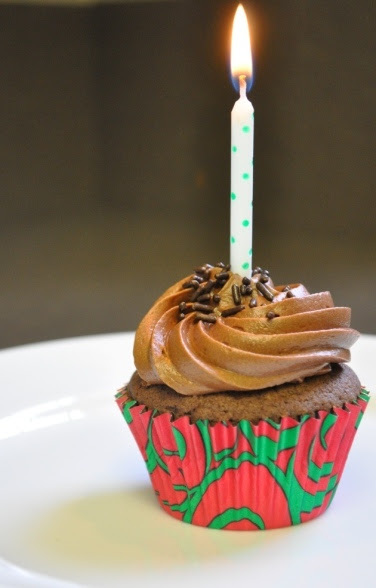 With all that has been accomplished in the last year I'm excited to celebrate my 1 year blog birthday milestone today. And this also happens to be my 100th post. I look forward to what is to come in the next year for The Ginger Snap Girl. 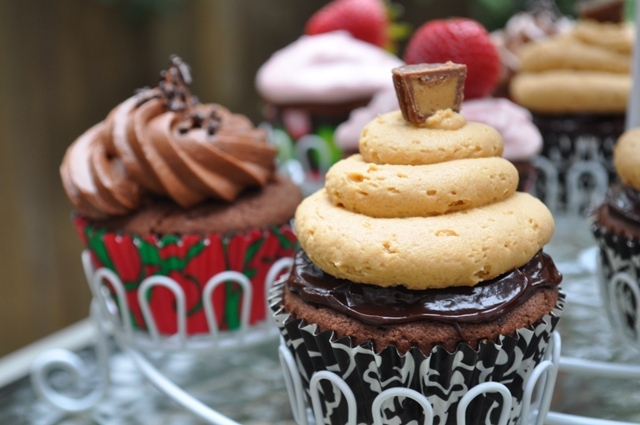 So let's get to the good stuff now and eat some cupcakes! One type of cupcake just wouldn't do for this celebration. I started with my favorite cake flavor--chocolate. I decided to make 3 chocolate cupcake variations encompassing some of my favorite flavor combinations. Chocolate and chocolate. 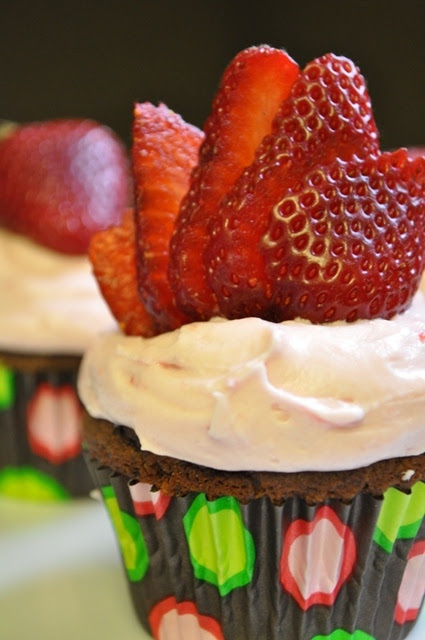 Chocolate and strawberry. And chocolate and peanut butter. And to make things even more exciting I decided this would be a true adventure by trying out all new (to me) recipes. I used a chocolate cake from Dorie Greenspan's Baking book called, "Cocoa Buttermilk Birthday Cake". sounds fitting, right? 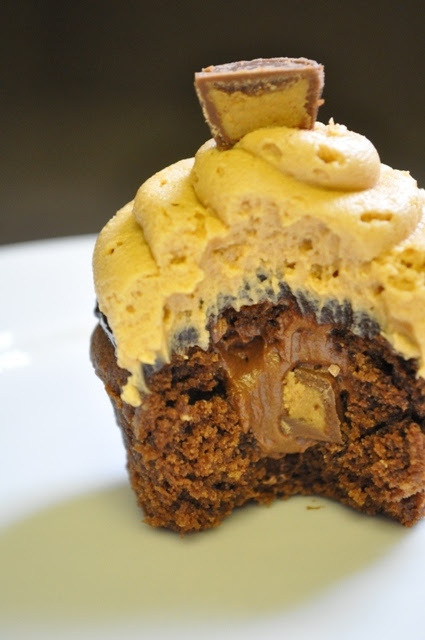 Another blogger, Laurie (founder of the online baking group Tuesdays with Dorie), described the cake as, "The cupcake as a whole is by far the best cupcake I have ever made. Ever." I was sold! I made the cake and frosting Laurie made as one of my 3 cupcake variations. The frosting was great! The cake didn't turn out like Laurie's I'm afraid. It was too dense and was on the dry side. I'm not sure where I went wrong with the recipe. But this is the risk you run when trying a new recipe for the first time (a subject for future thought). In the meantime, the real stars of today's celebration are the frostings. 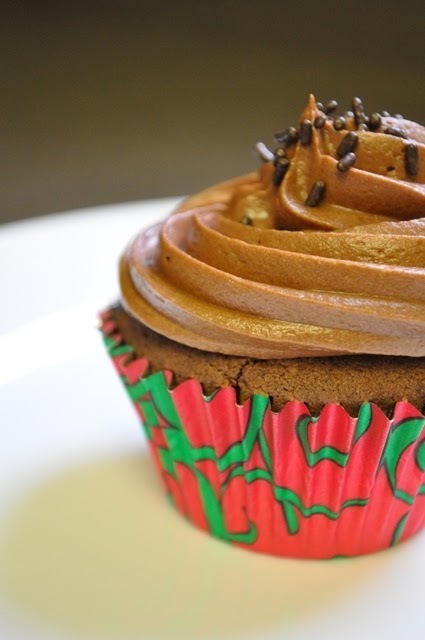 The chocolate cream cheese frosting is packed with chocolate (cocoa) and has a light silky texture, finished with a little tang from the cream cheese. Yummy. This frosting packs a solid peanut butter punch but has such a light, airy, texture. It has enough body to pipe and holds its shape beautifully. 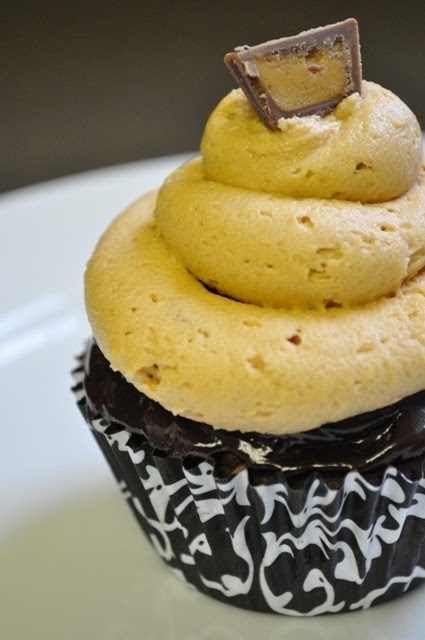 It is peanut butter frosting perfection and is begging to paired with chocolate. In fact I was thinking this would make a great filling for a homemade oreo cookie. Really delicious! The strawberry cream cheese frosting is divine. 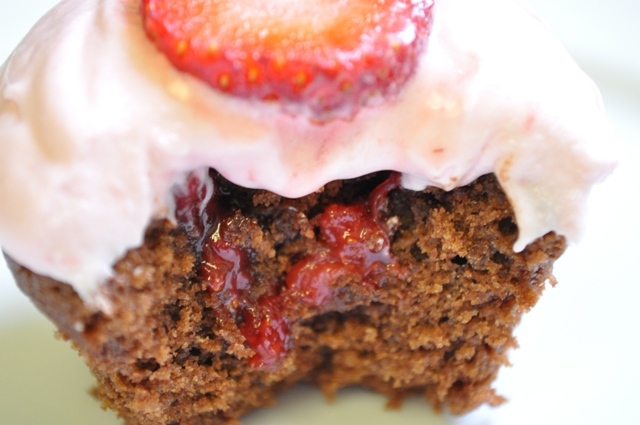 The strawberry flavor comes from homemade strawberry preserves, which really "make" this frosting. The texture is soft and luscious. It doesn't have as much body as most cream cheese frostings because of the moisture of the preserves. I wanted it to have a more than a "light" strawberry flavor, so I was generous with the amount of jam I used. All three of these frostings are definitely keepers and will go into the arsenal of make again recipes. The recipes can be found at the end of the post. Ms. Sassy Strawberry was filled with same homemade strawberry preserves used to make the frosting. Mr. Peanut Butter was filled with the chocolate cream cheese frosting and chopped bits of Mini Reese's Peanut Butter Cups. Oh, and I almost forgot to mention, before the frosting went on, he got a coating of chocolate ganache after the cupcake was filled (you can see it clearly in the peanut butter cupcake photo up above). And finally, Mr. Chocolate was filled with more chocolate cream cheese frosting inside. My original intention was to fill it with ganache...but since the cake was on the dry side I decided the frosting would help add a little extra moisture that ganache would not. I have to give a huge thanks to my sister Katie who helped me make all the elements of this cupcake trio. And thankfully she helped me eat them too as did many of my co-workers. Though they weren't perfect, they were the perfect way to celebrate The Ginger Snap Girl turning 1! Thank you to each one of you that takes the time to read my blog (especially those of you that have made it all the way through this post--I'm quite certain it takes the prize for longest rambling to date). I hope you are inspired to get into your own kitchen and make some tasty creations. For the Cocoa Buttermilk Birthday Cake recipe seen in the post click here. Cream the cream cheese and butter until fully incorporated and smooth. Add the cocoa powder, mix to combine. Add the powdered sugar until desired sweetness and consistency is reached. Add 1 tablespoon heavy cream, whip until light. Yields enough to lightly frost 24 cupcakes. Place the confectioners’ sugar, peanut butter, butter, vanilla and salt in the bowl of an electric mixer fitted with a paddle attachment. Mix on medium-low speed until creamy, scraping down the bowl with a rubber spatula as you work. Add the cream and beat on high speed until the mixture is light and smooth. Yields enough to frost 12 cupcakes. In a medium saucepan bring the berries and sugar to a boil, stirring occasionally. Reduce heat to a low boil or simmer and cook down berries until they are thickened...about 20 minutes or so. Adapted from You Made That? In a large bowl put room temperature cream cheese and butter together and mix until light and fluffy. Add sugar 1 cup at a time and then add strawberry preserves and mix well. I love this post! The pictures turned out amazing and so did the cupcakes! I will help you bake (and eat) anytime! YUMM!!! I can't wait to see what the rest of the years holds for the Ginger Snap Girl! 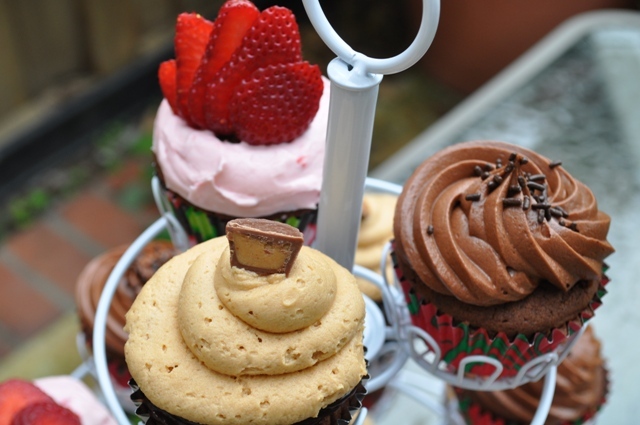 Oh yum..cupcakes..of every flavor my heart can think of!!! I love this and I love that you are celebrating your one year blog anniversary!! Happy Bday blog!! Happy Blogiversary Gloria! 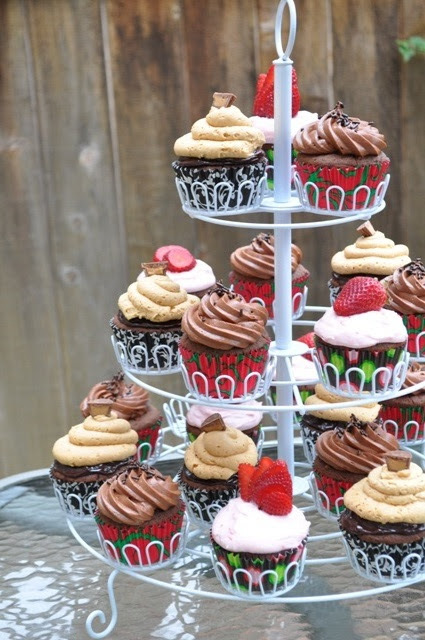 I love each of your cupcake treats - they're all gorgeous and sound ridiculously delicious! Thanks for sharing your story - I'm so glad you've been cancer free for 6 months. Wishing you lots of good health in the year to come. Happy 1 year blogoversary! Lovely pictures! I think I see teeth marks in that frosting! Happy blogiversary, Gloria! All the cupcakes look spectacular, way to celebrate in style! 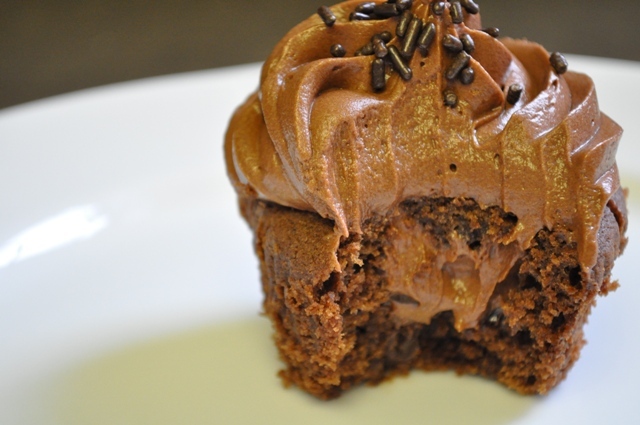 I must try the cocoa buttermilk cupcakes, they sound divine. Thanks for sharing your story with us; it is good to hear you are cancer-free and healthy.